(lit. Board) was the name of the miniaturized ​brotschießel​ like rod with one end being thin and flat serving as its ‘striking’ surface, described further as ‘…often preposterously large of leather or of split clacking wood and sometimes gilded…’ (Freytag, 1863, p1​52​). The ​Pritsch​ was held and employed by the master of ceremonies (Pritschenmeister​) of ​Schützenfest​ and ​Fechtschule​. They were part announcer, jester, entertainer, and disciplinarian for these events. For more look to the ​Nouveau Dictionnaire Allemand-François ​entry on​ ‘Pritchmeister​’ ​(1762, p451), and the entry entitled ‘Pritschenmeister’ in ​Reallexikon Der Deutschen Altertümer Götzinger (1885, p812); review the biographies in ​Allgemeine Deutsche Biographie​ of XVI century Pritschenmeister Lienhard Flexel (vol. 7, 1878, p119) and Heinrich Wirrich (vol. 55, 1910, p385-387). 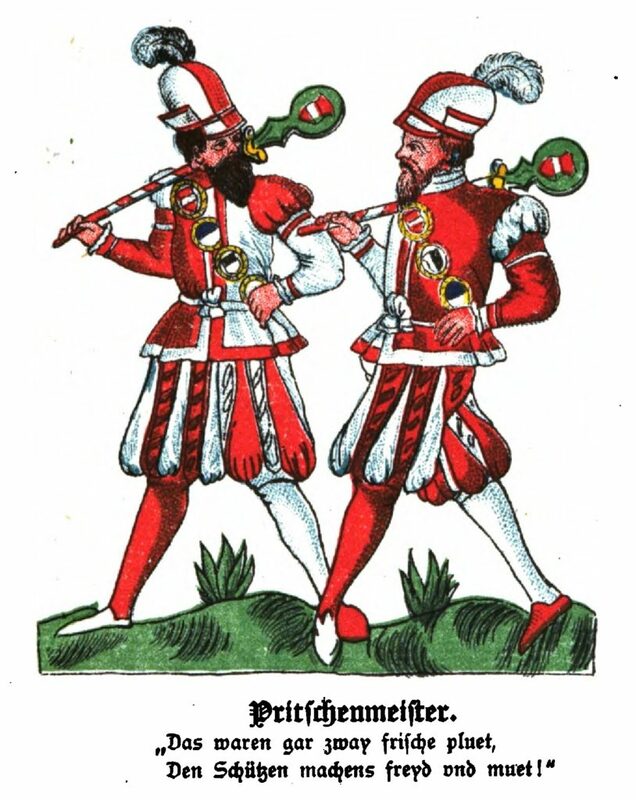 For descriptions of the ​Pritschenmeister​ role in the ​Schützenfest​ of the era see the ​Pritschenmeister​ for Archduke of Austria Ferdinand II in the work entitled ‘Ordentliche gründliche Beschreibung des großen Schießen Stahloder Armbrust Zwickaw den 25 Augusti​’ (Siber, 1574) and chapter three of Georgiana Malcolm’s translation of Gustav Freytag’s ‘​Pictures of German Life in the XVIIIth and XIXth Centuries​’ (1863, pp1​34–186​). lit. to tempt/ to attack (Dasypodius, 1535, 144r1 and 218r1), or a seizing action. 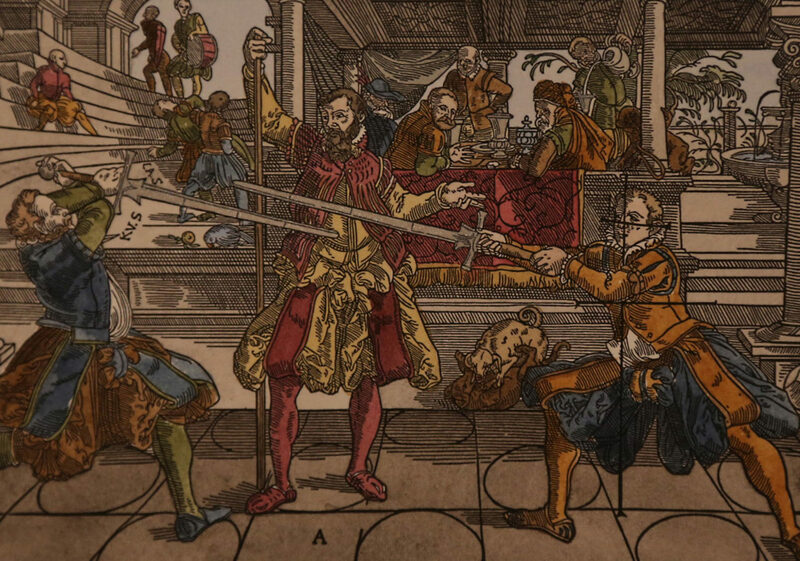 As a fencing term, Master Meyer often used it with the meaning of one’s a first attack, an inciting action seeking the opponent’s reaction, while seizing the Vor. Let us remember Peter Dasypodius who died in Straßburg this day in 1559. His works have been a boon to researchers and translators the world over. He of course also holds a special place in the hearts of Historical Fencing researchers and translators!